Patti Bryan of Coushatta is featured on the Discovery Channel’s hit series “Moonshiners.” Her mayhaw moonshine is being distilled and sold in liquor stores nationally. The Coushatta native’s name and face have become synonymous with liquor, the moonshine variety. As a little girl Patti probably did not think her future lay in the illegal distribution of alcohol, but as a woman, a wife and a mother that is exactly the route destiny took her. She and her father, David Parker, have made a name for themselves on the Discovery Channel program “Moonshiners” since they joined the show in November 2015. (It airs Tuesdays at 8 p.m.) Discovery Channel was looking for new blood for their series and having a Louisiana tie-in appealed to the producers. Having a father/daughter team was unusual and had the potential to be a draw for viewers. They’re still going strong and are gaining in popularity. With popularity comes opportunity. 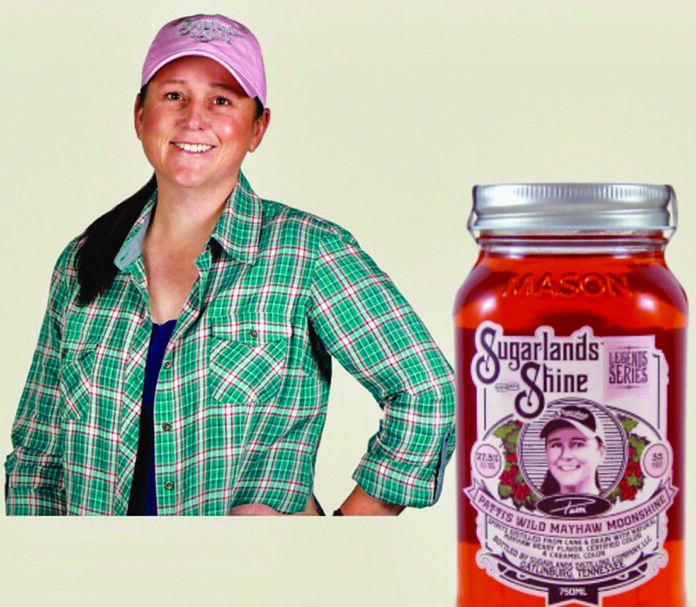 Sugarland Distillery Company based in Gatlinburg, Tenn., contacted Bryan with a proposal to package and distribute, legally, her mayhaw moonshine recipe. An agreement was reached and Bryan is now the first female on their label. Why mayhaws? A couple reasons. Everyone in this area knows the deliciousness of mayhaw jelly, but “Northerners don’t know mayhaws,” Bryan said. “They only grow in the south so this is a new flavor for them.” Second, the distillery, and Bryan wanted to appeal to women. The pink shine, due to the natural coloring of mayhaws, and the less than 100 proof recipe had all the right stuff to market. “Men want the 100 proof or more but most women, moms, tend to like something a little milder,” Bryan said. Patti and David spent at least a year getting the recipe right and seeing it now on shelves in 27 states is gratifying. Bryan’s shine is featured in the Legends Series. Sugarlands Distilling Co. is an exclusive partner with Discovery Channel’s Moonshiners Legends to bring their traditional recipes to the dinner table, holiday table or backyard barbeque. They also feature shines from show regulars Mark Rogers, Mark Ramsey and Digger Manes, Steven Tickle and Jim Tom Hedrick. Now back to the woods of Red River and surrounding parishes where the duo continues to brew their moonshine. They have expanded their duo to include another family member, Cupcake, a pet pig. The little porker accompanies father and daughter to their still. Not sure of her role yet, taster or lookout, but she is on the job. In 2015, Bryan and Davis admitted they knew making moonshine was illegal and together stated it did not matter. What they do is carry on their family heritage. Bryan is a fourth generation shiner. Some pigs are trained to hunt truffles, but Cupcake is a certified Shiner! Patty Bryan and dad, David Davis, take a 'shine break near their still.